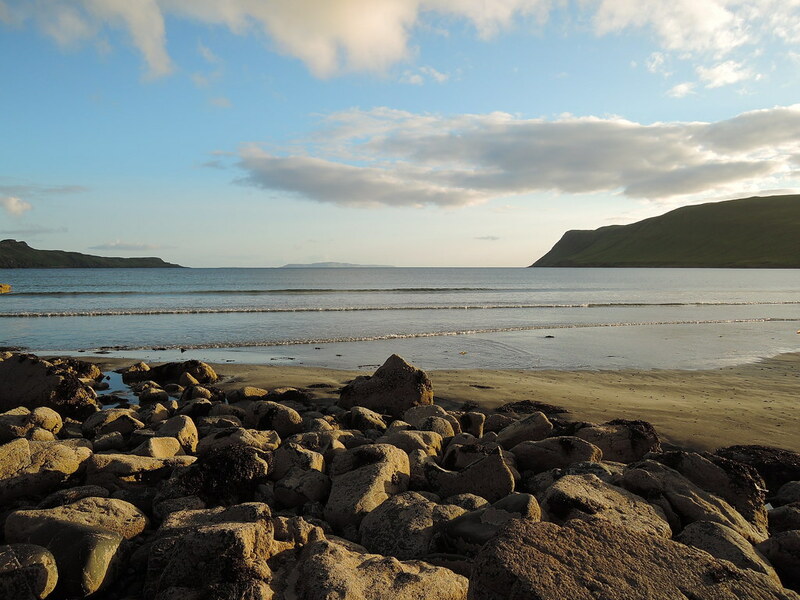 5hr drive to Glenbrittle campsite then a relaxing walk on the beach before crashing out. 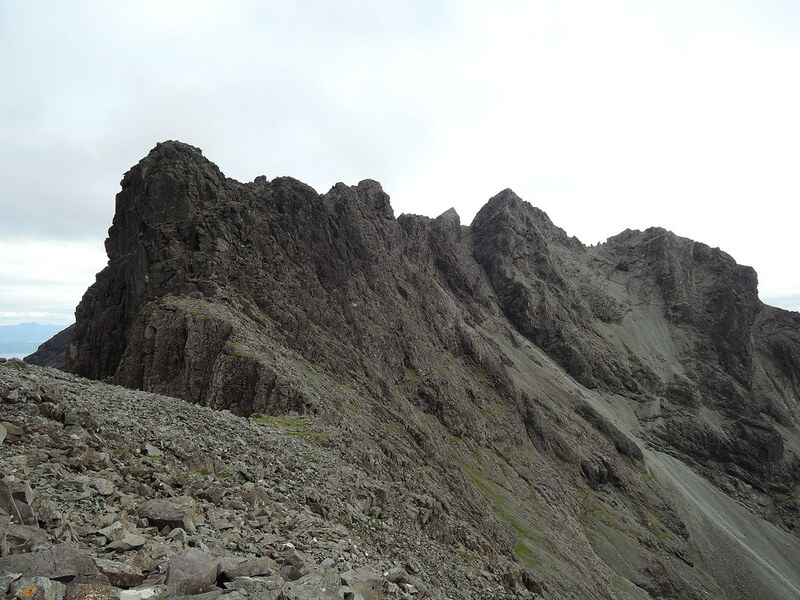 Next day, good path in to Coir' a'Ghrunnda then continues high on the left hand side of the coire. I passed 3 guys on the way in, they were doing the same hills then adding the In Pinn (think one of them was a guide). 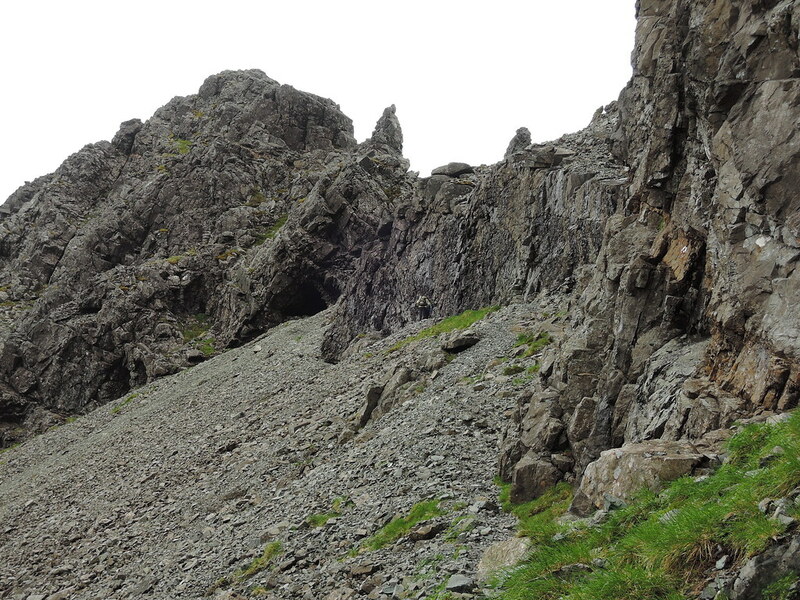 Descends down to waterfall then a scramble up to the loch. 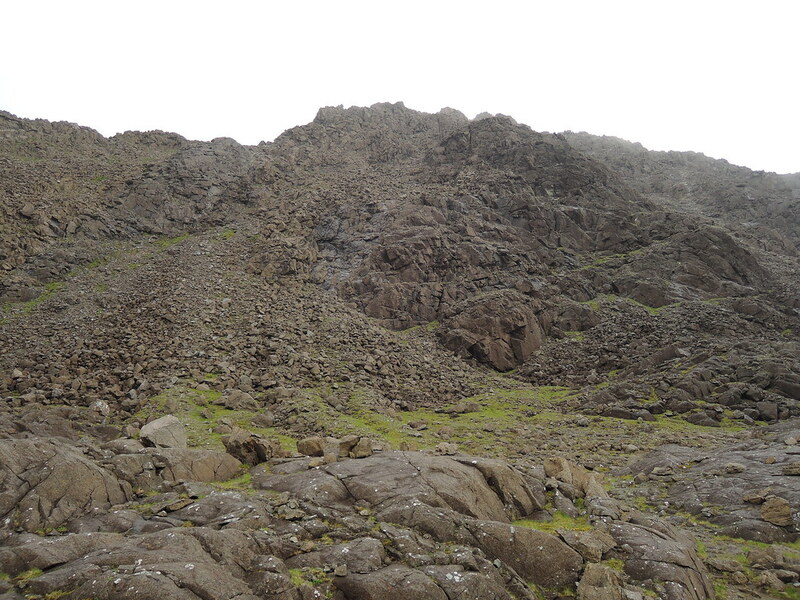 Boulderfield leads up to Sgurr nan Eag, rain started here but cleared up about an hour later. 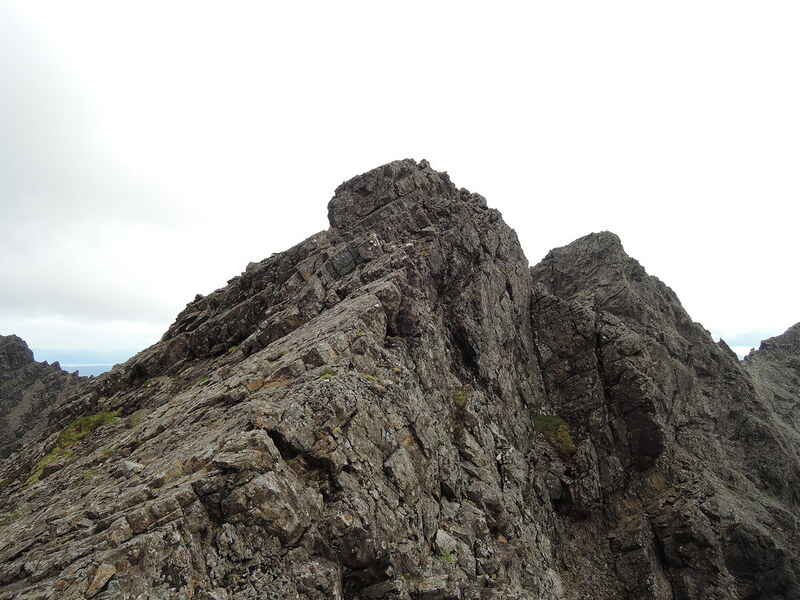 Up on the ridge, still a bit claggy. Weather cleared on the way back from the cairn. 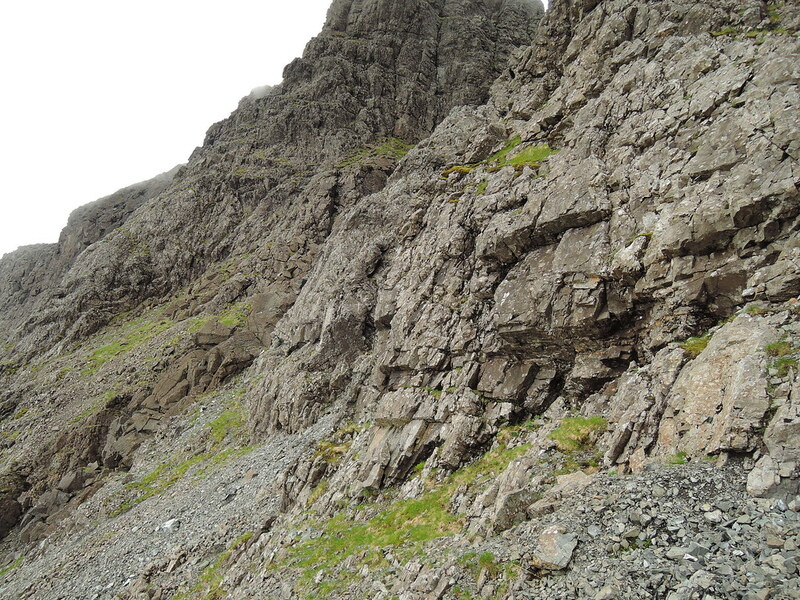 Alasdair is on the left and I'll be taking a path on the scree below the summit cliffs. 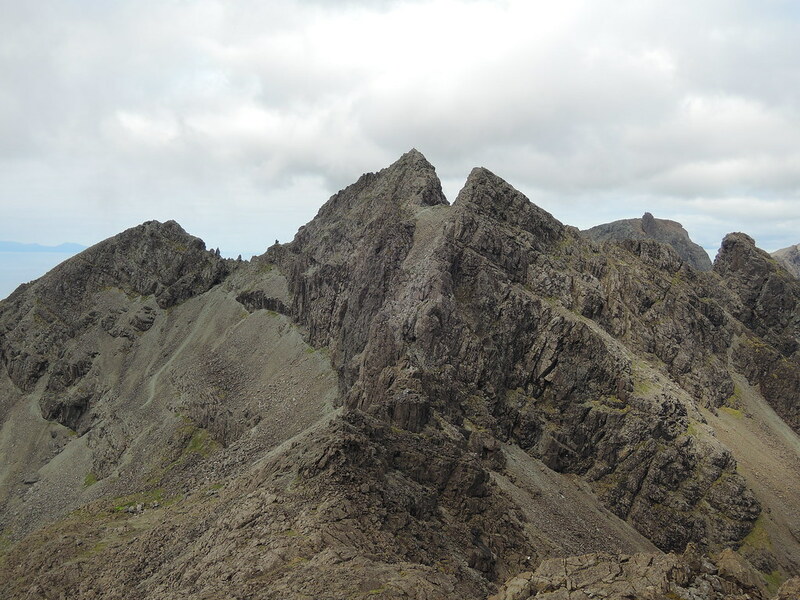 Sgurr Dubh Mor on the right. 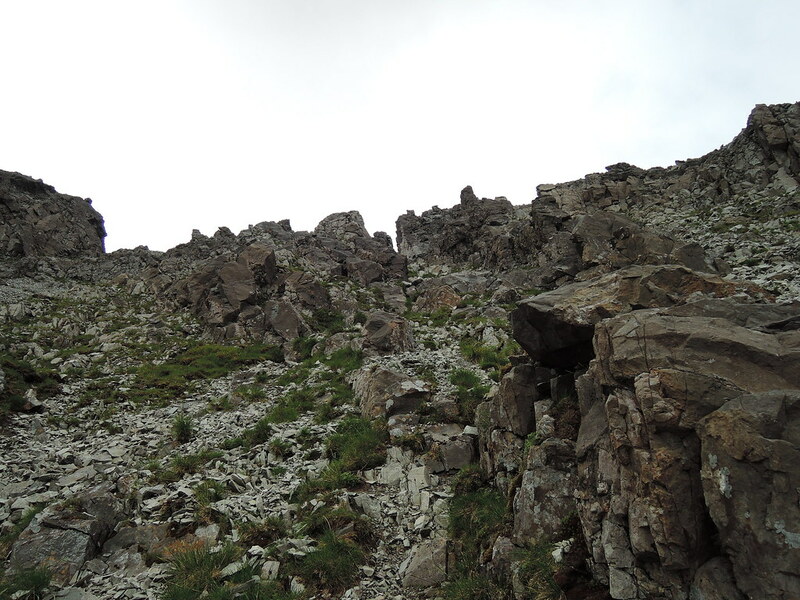 There isn't much distance to cover but it takes longer than expected as there's scrambling on the way and even longer if you stick close to the crest of the ridge and avoid bypass paths. 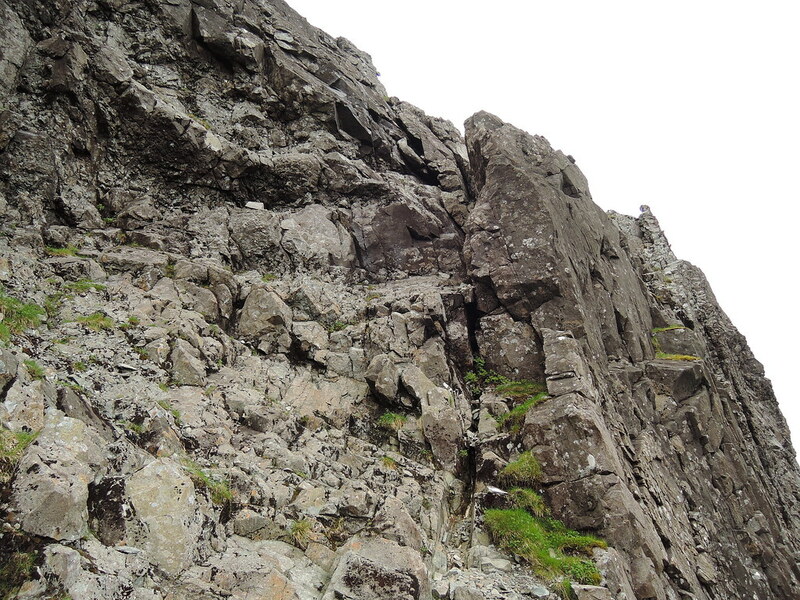 Close up of Sgurr Dubh Mor, grassy terraces with paths and scrambles up to the next level. Choice of routes here. 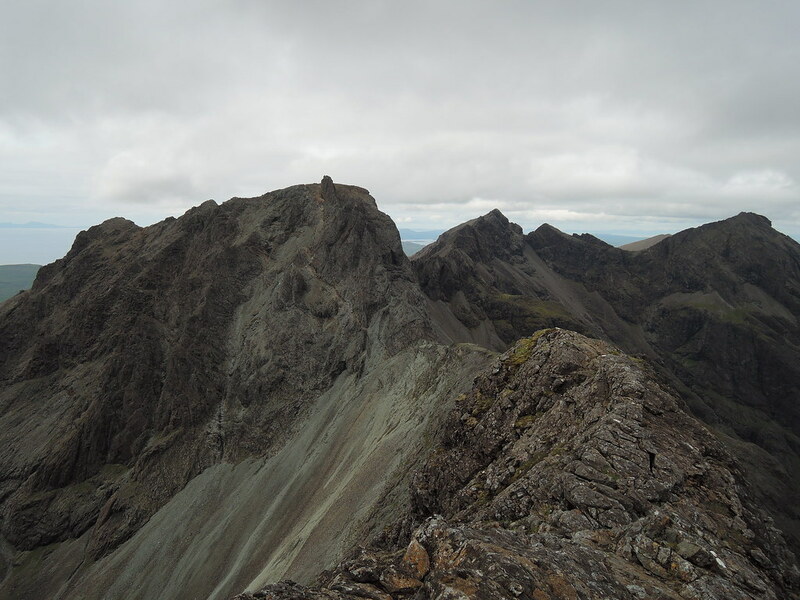 First, need to get over Sgurr Dubh an Da Bheinn. Also need to get back over this on the way to Alasdair. 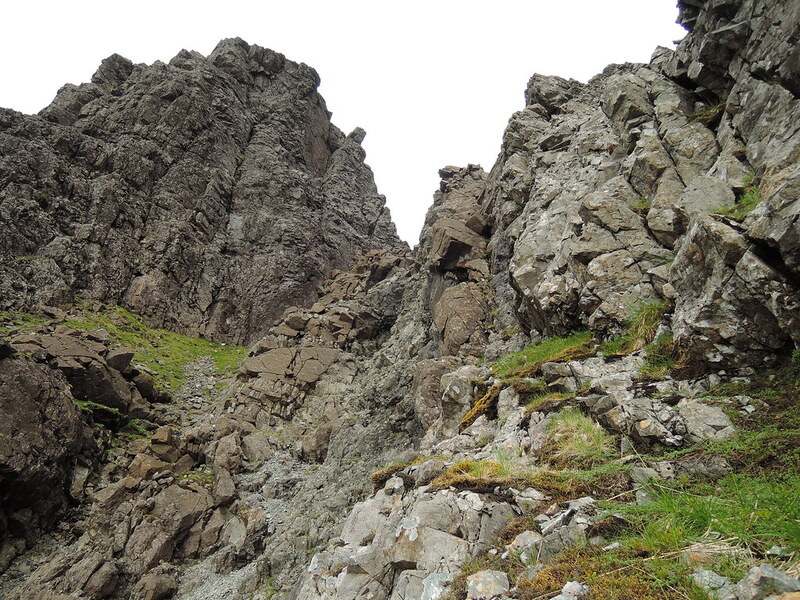 Caisteal a Garbh-choire blocks the way, looks possible to scramble up but I took the bypass path to the right. Would need to abseil the other side though, judging by the ab tat. 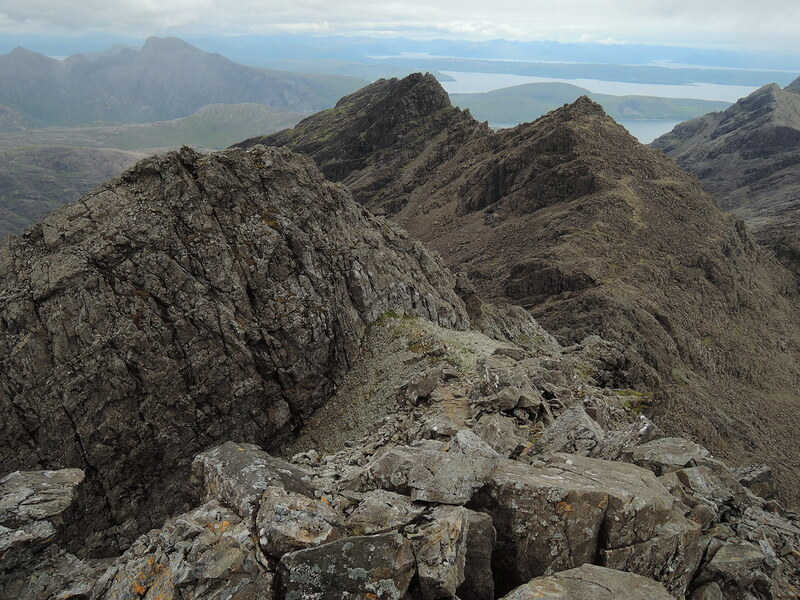 Alasdair from Sgurr Dubh an Da Bheinn. Scrambeson the way to Dubh Mor. 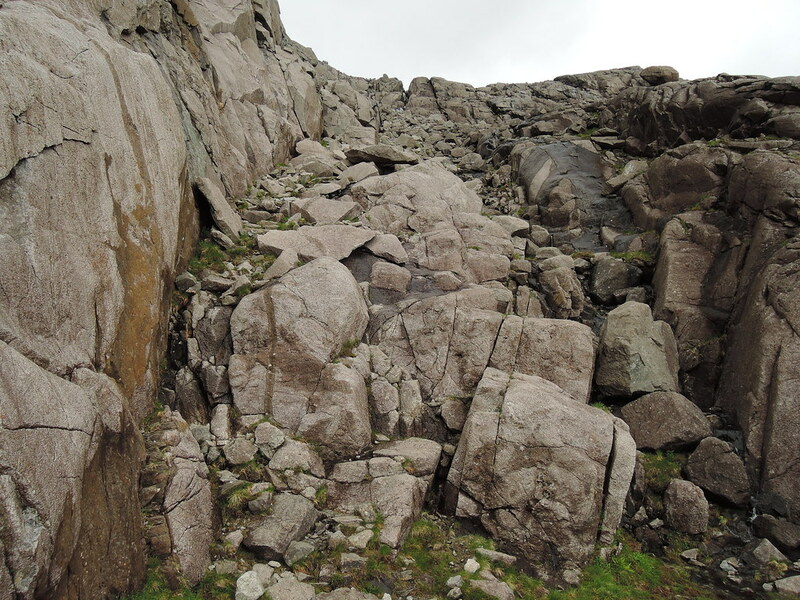 Paths along the terraces on the way up, can choose which bit to scramble up or down if one bit looks dodgy. 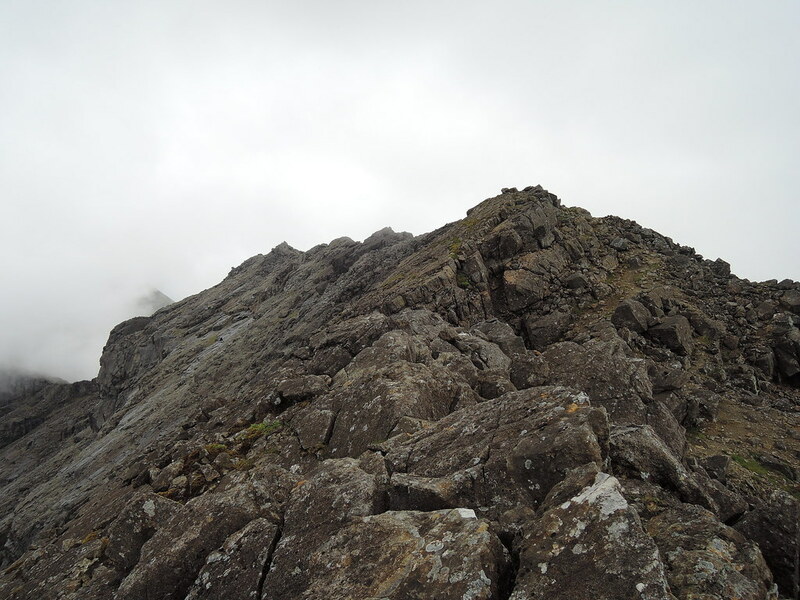 On the way back from Dubh Mor I trid to stick to the crest of the ridge between it and Sgurr Dubh an Da Bheinn. Guided party behind me, roped up and moving together on Dubh Mor descent. 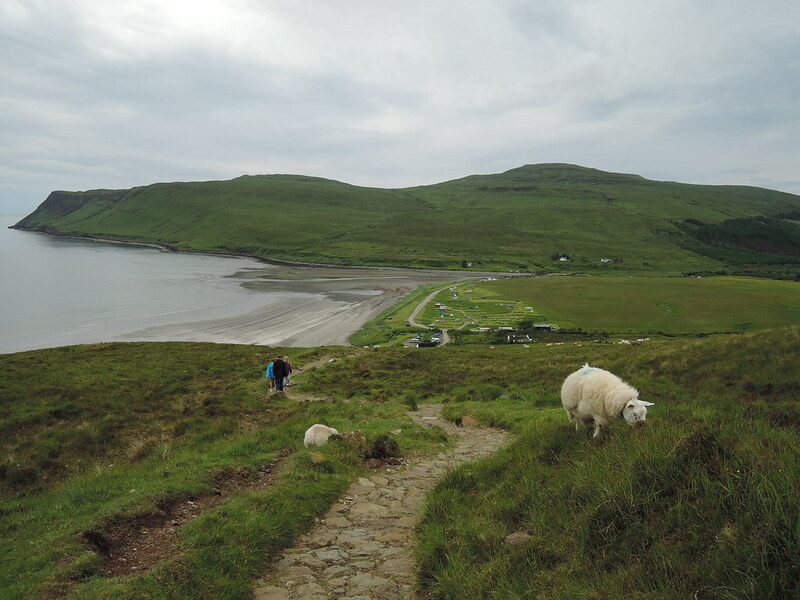 Then round to Alasdair on the path at the bottom of the cliffs. 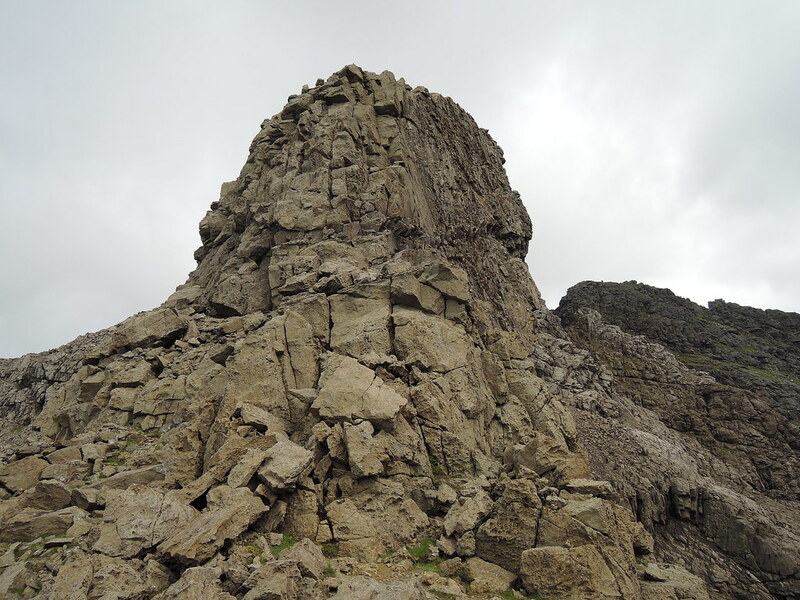 Then turn right and head for the chimney above the lower crags. 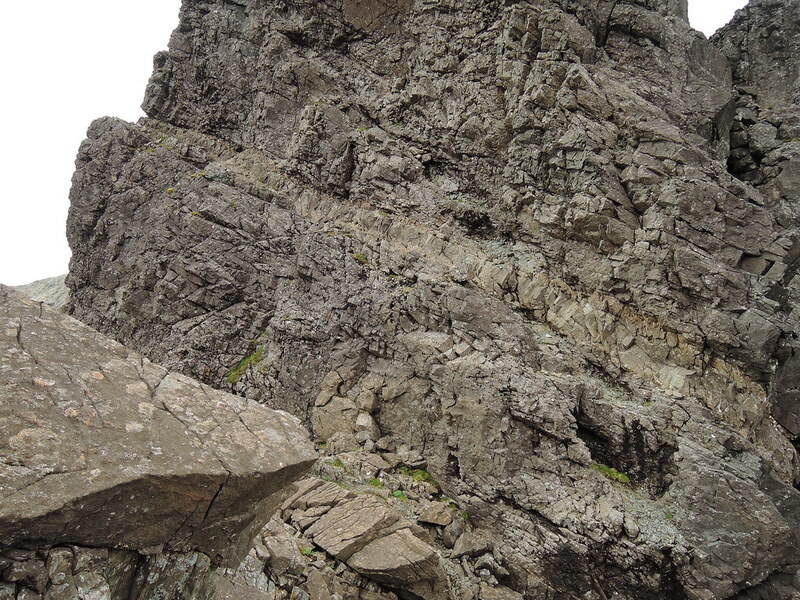 Chimney was easier than expected, then more scrambling over rock with loose stones on the way to Alasdair. 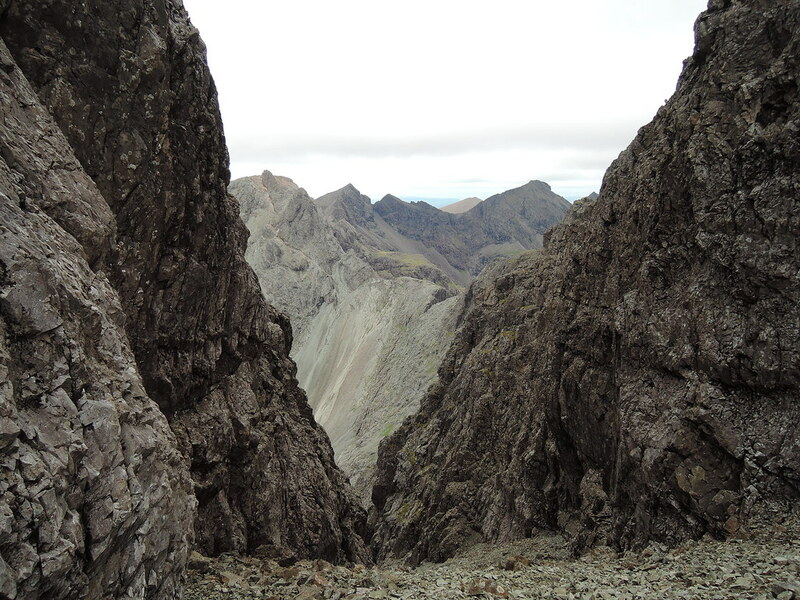 Descent from Alasdair to the stone chute, Sgurr Dubh an Da Bheinn and Sgurr Dubh Mor behind with pinnacles on the ridge in between. 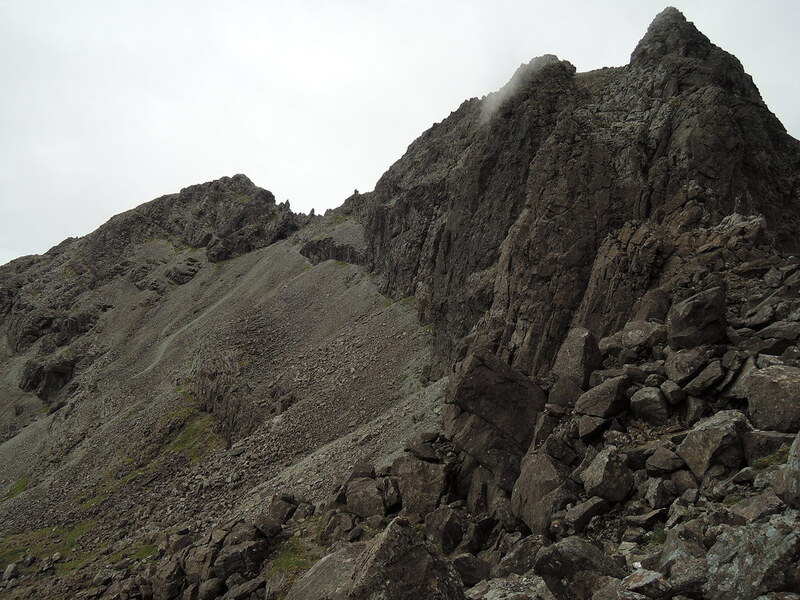 Sgurr Thearlaich is on the other side of the stone chute, I had decided not to do this today as the descent could be tricky to find and graded Mod. Had a look at it anyway, nothing looked easy to get up. ...so it was down the chute. 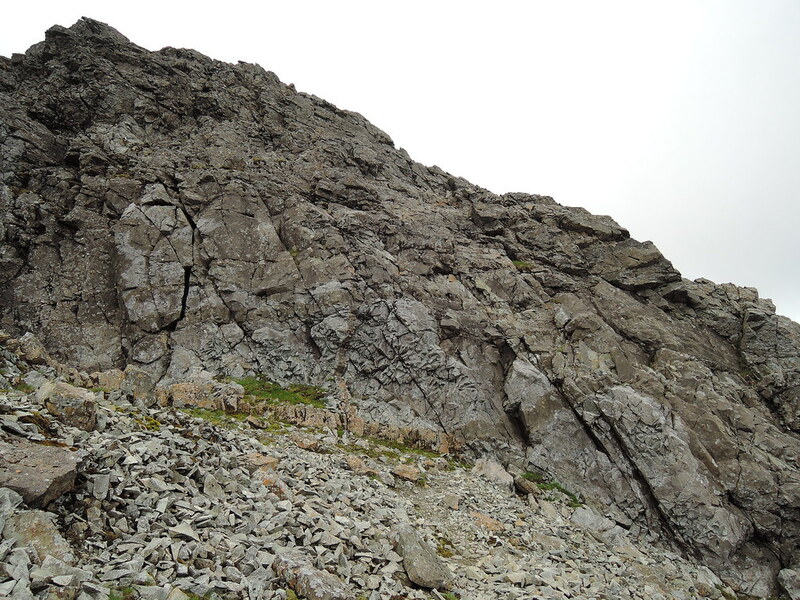 And round some rocky bits to bealach Mhic Choinnich. 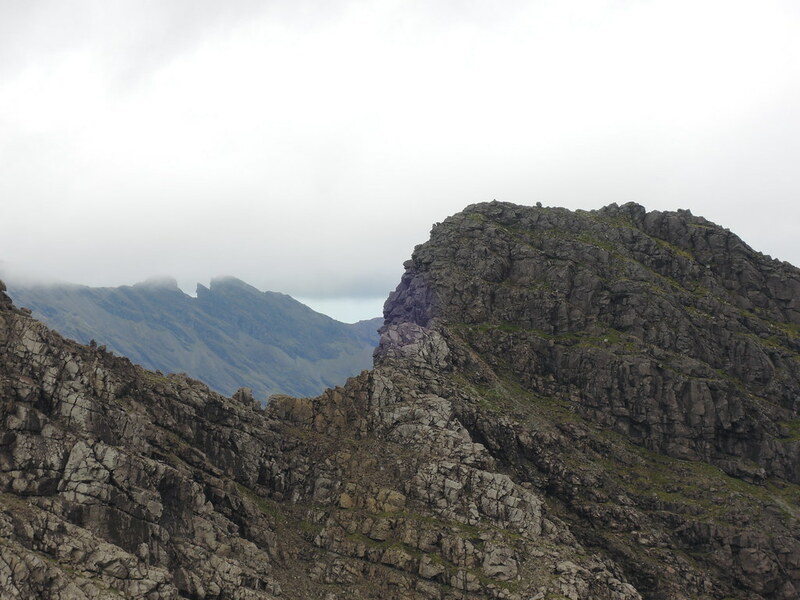 Hart's/Collie's Ledge starts at the right of the bealach, then up and to the left and continues on the left of the ridge. 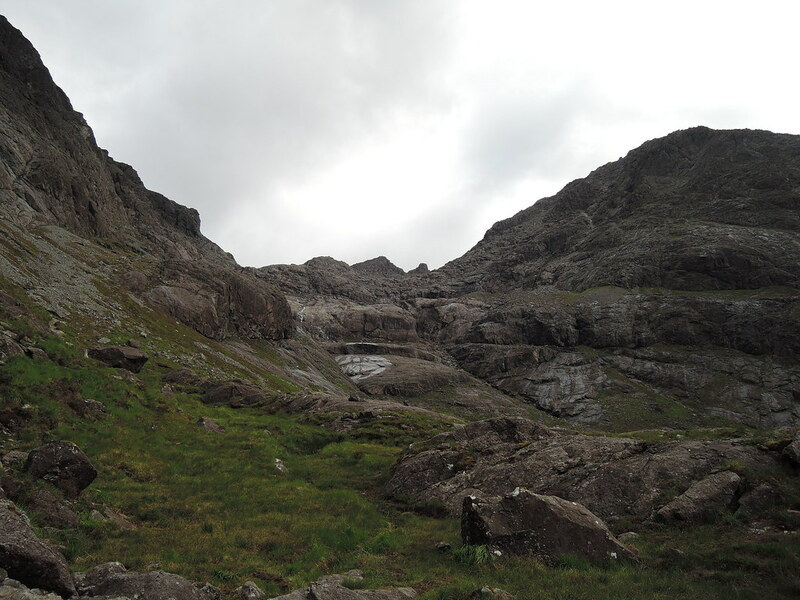 I could hear voices behind me on Thearlaich - it was the guided group about to give a free demonstration of the descent on the Glen Brittle side. I've put all the photos of this on Flickr with a route diagram from Noel Williams. It looked fairly easy from my comfortable seat on Hart's Ledge. 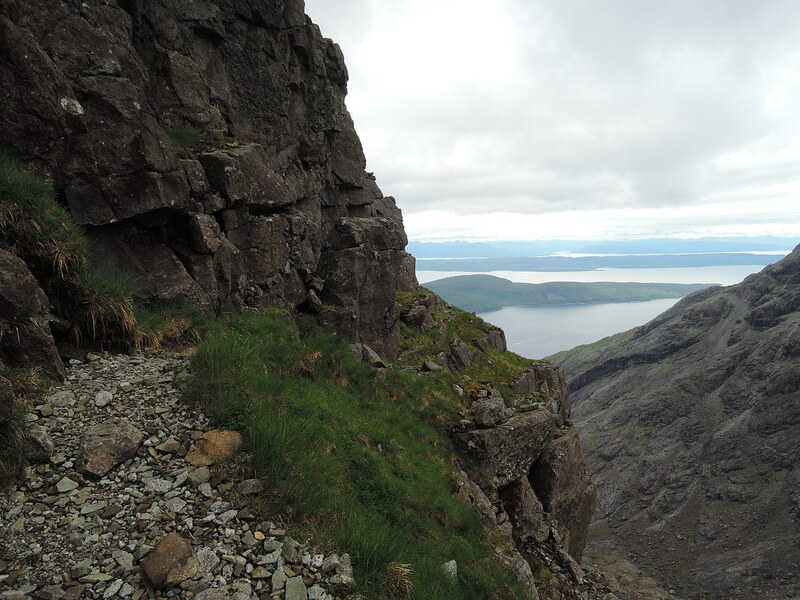 Not far from the top of the ledge to Mhic Choinnich summit. 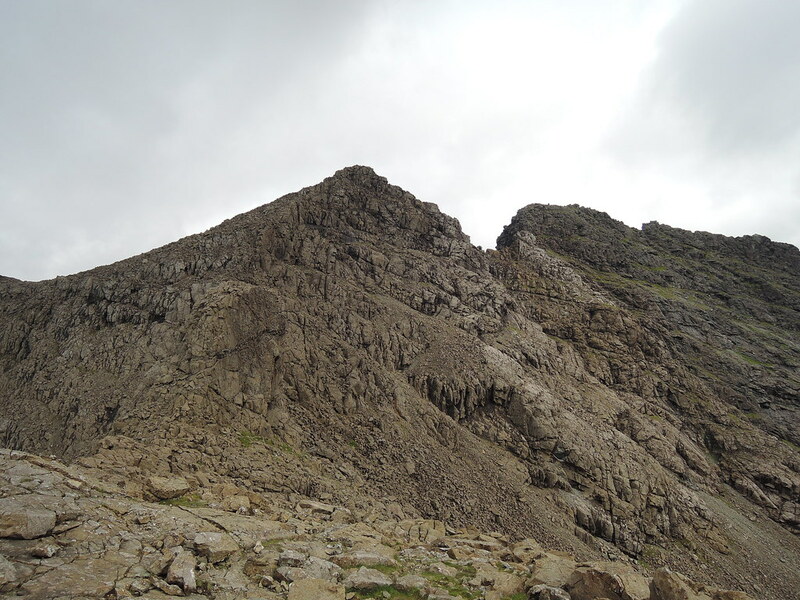 Then on to the An Stac screes descent, In Pinn ahead on the ridge. 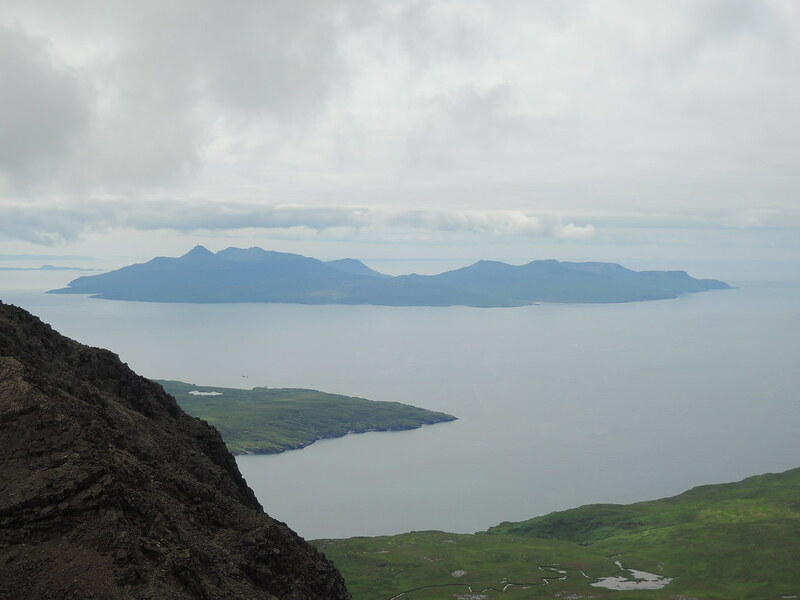 Mhic Choinnich, Thearlaich and Alasdair. 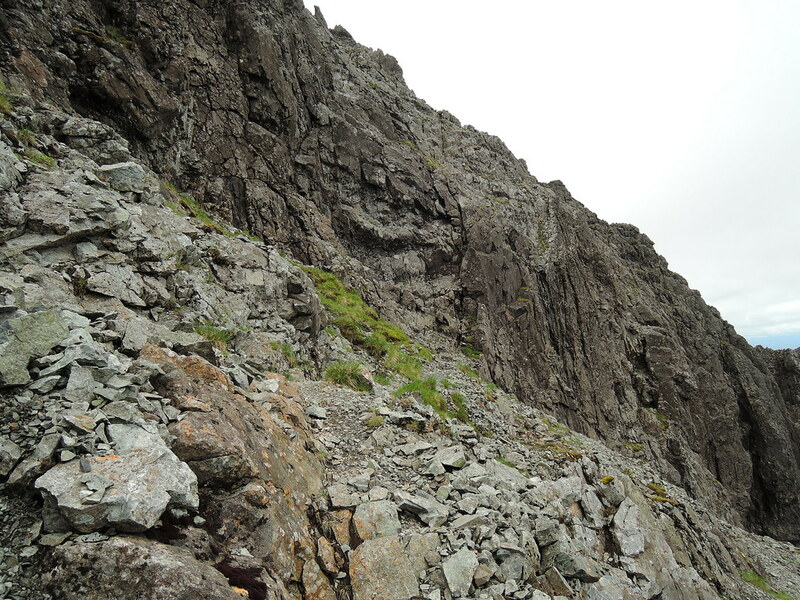 And into the screes, pretty hopeless at this and having an open toe on my shoe didn't help keep the gravel out. Finally figured that planting the heels in firmly seemed to work best and kept the gloves on since I was falling over regularly. Saw an expert racing down the stone chute as I struggled on. Good path through Coire Lagan back to the campsite. And a hot shower before the drive home . excellent report ..very informitive and great photos too. 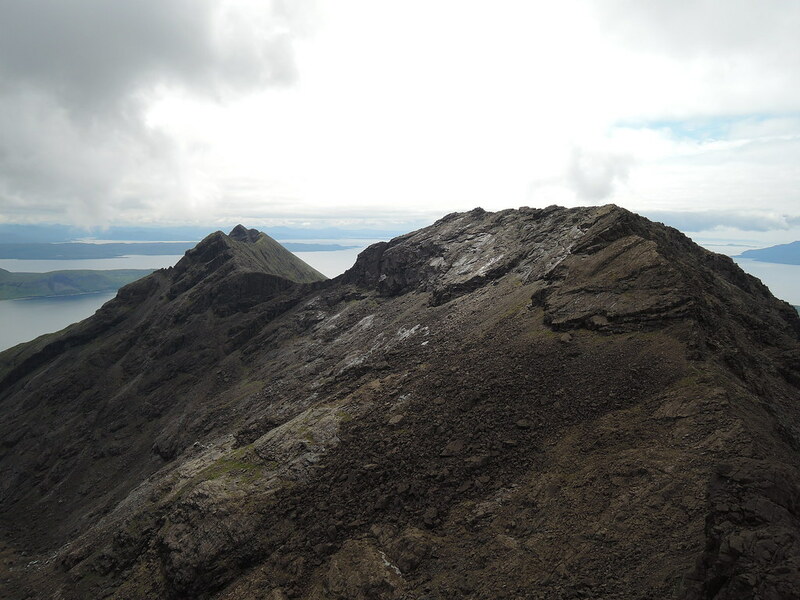 The photo of Eag and Gars-bheinn is particularly lovely. great light. Still got Eag and dubh mor to do so very useful. 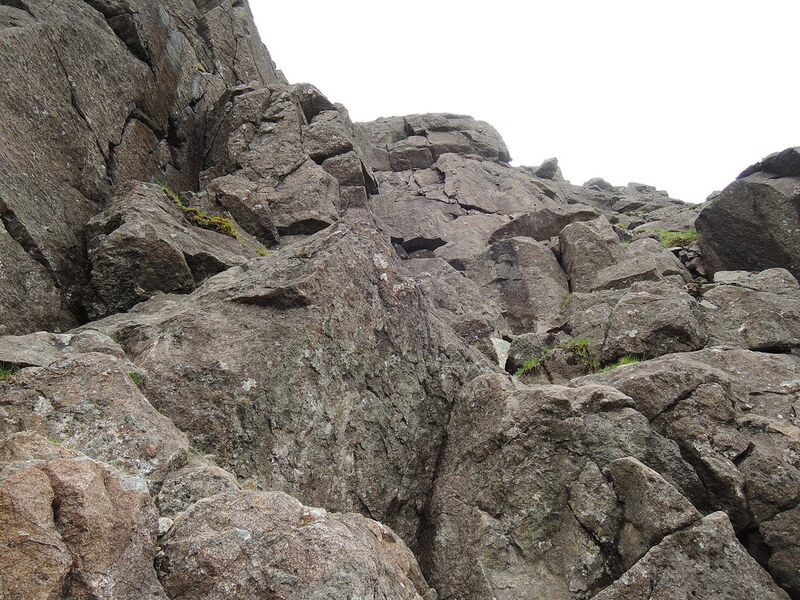 any tips for the scramble up dubh mor? ive heard it can be quite tricky to find the "right route"?! It was easier than I expected, I went up one way and down another so ther are a few straighforward options. 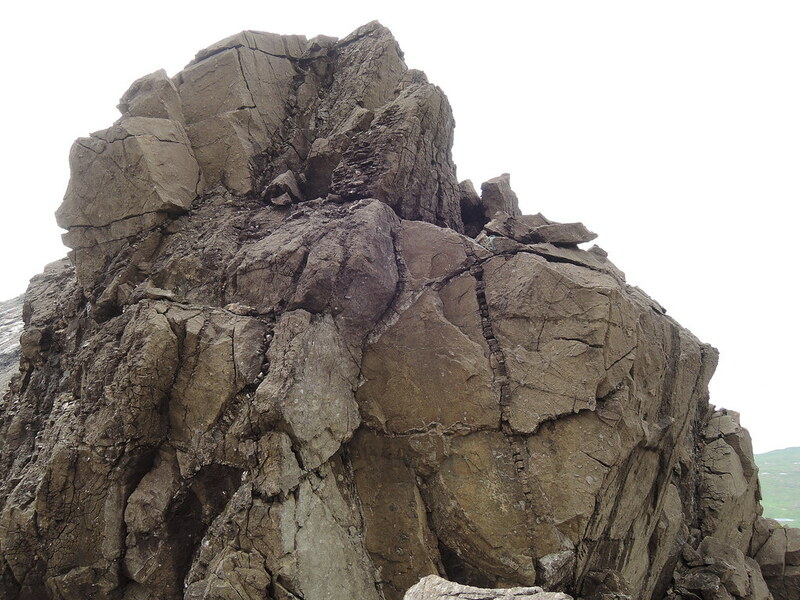 If you walk along the path at one level you can find something that looks ok to scramble, the rock will be polished at the bits where a lot of folk have ascended/descended. I brought a photo from Steve Fallon's site but just winged it on the day. 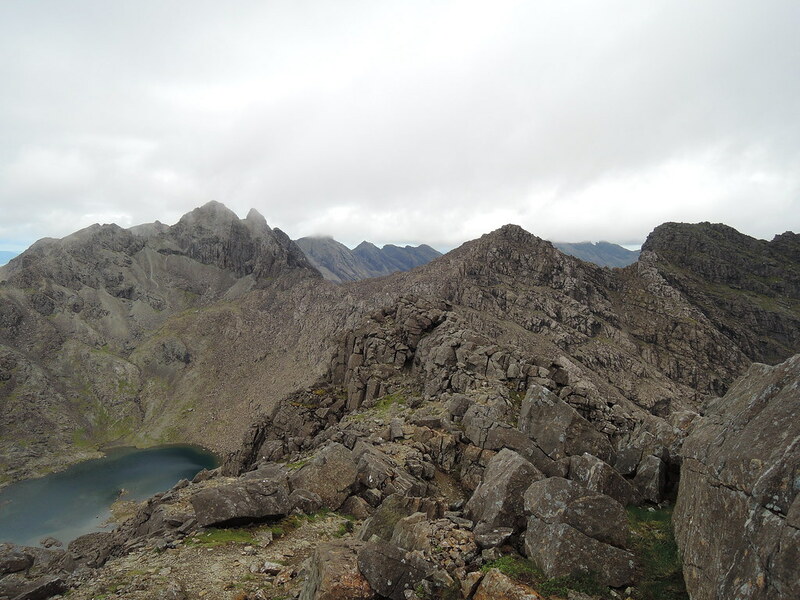 A fine photographic record of a big Cuillin day Spectacular stuff and well done. 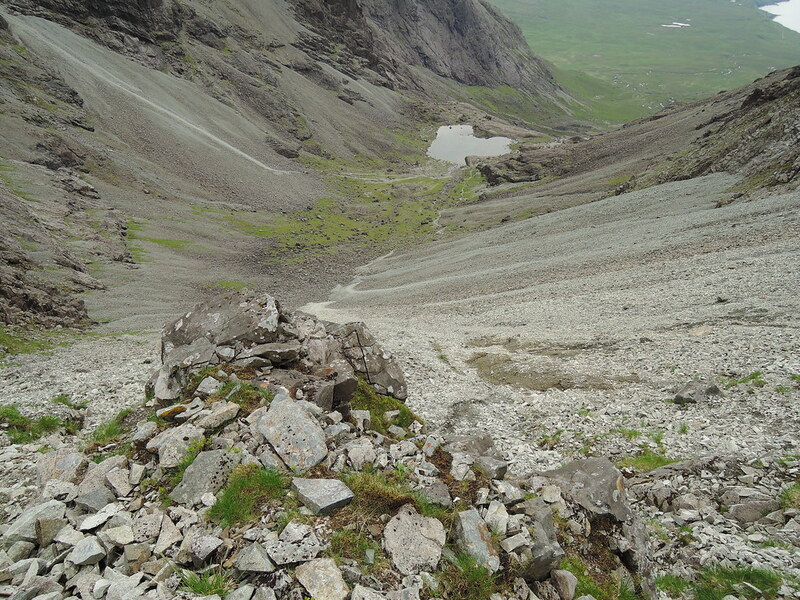 The descent from Thearlaich to Bealach MhicChoinnich looks steeper and scarier than I remember it - but that was in 1983! 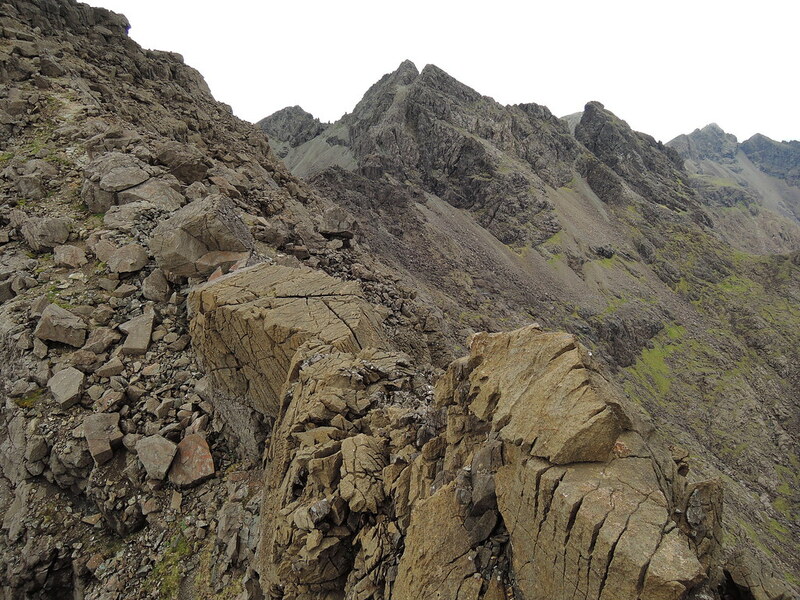 Three of us were doing the Lagan round and had a rope with us for the Inn Pinn: looking at your pics it makes me cringe that we didn't bother roping up for that descent, though we had no problem locating the passage on the coruisk side, which is easier. What reckless whippersnappers we were in those days! And just what I need as research for going up there as soon as the weather looks auspicious (long drive for me, so can't take chances) because I'm taking someone else (= responsibility). I've done the ridge a couple of times, but I when I read reports like yours I see there's a lot I've forgotten. 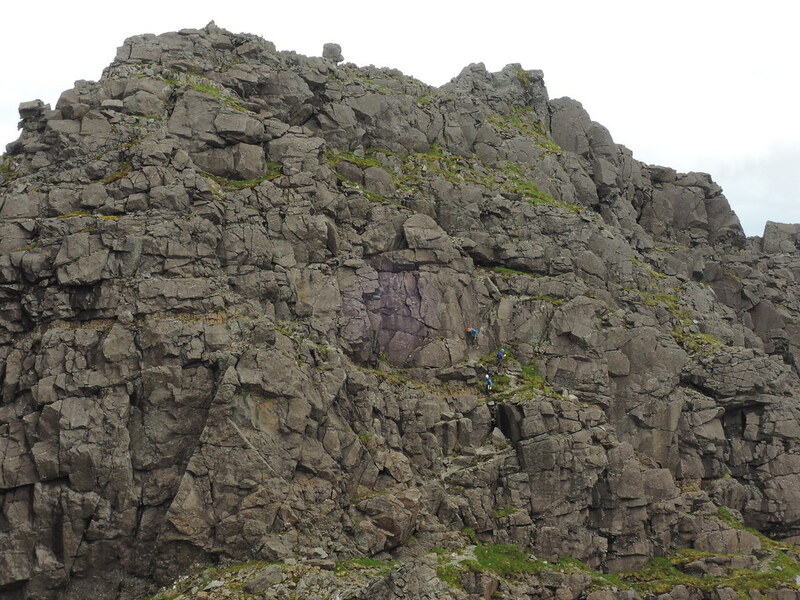 It was "interesting" to see the party descending Sgur Dubh Mor roped up. I find it quite terrifying to be roped: I'm in a permanent state of fear that someone will pull me off my perch, or vice versa. I've done it a couple of times on a training course, but never since; and I've never heard any explanation of the practice that makes any sense to me whatever. 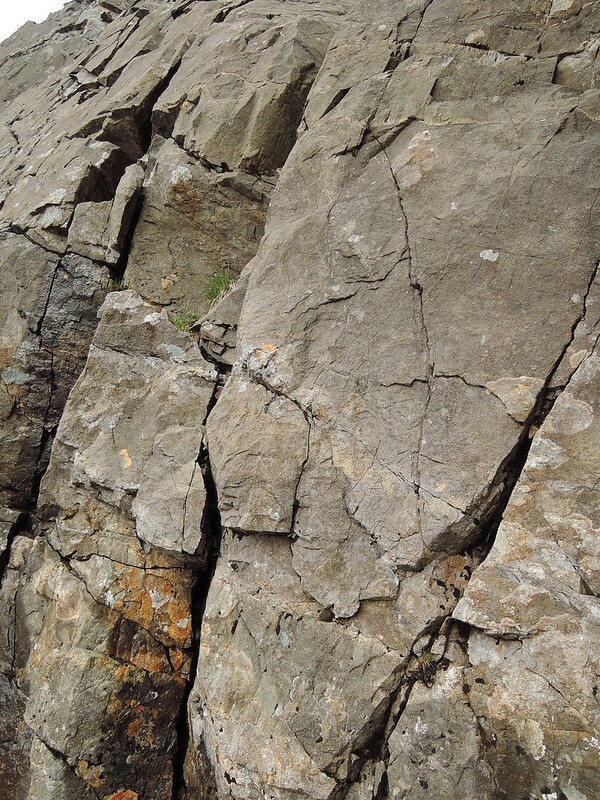 Finally, I loved the Flikr sequence - again, you can really feel the rock. Can't wait for high pressure over the NW Highlands"! BTW were the 2 scramblers just folk that happened to be there??? They really make the pics by creating the sense of scale and context. Thanks for posting - I've been poring over it, and no doubt will continue to do so until the long-awaited high arrives! Alteknacker wrote: BTW were the 2 scramblers just folk that happened to be there??? They really make the pics by creating the sense of scale and context. Cheers, the scramblers on the Thearlaich descent were the same group whe were behind me all day - luckily they appeared at the right time to give me a front seat view. I'm assuming they were a guided party as they got the helmets on in Coire Ghrunnda and did all the scrambly bits roped up. Good luck with the weather, it seems to have its own unpredictable microclimate! A fine route that, gman. We did the southern 3 with a guide and got some great views. 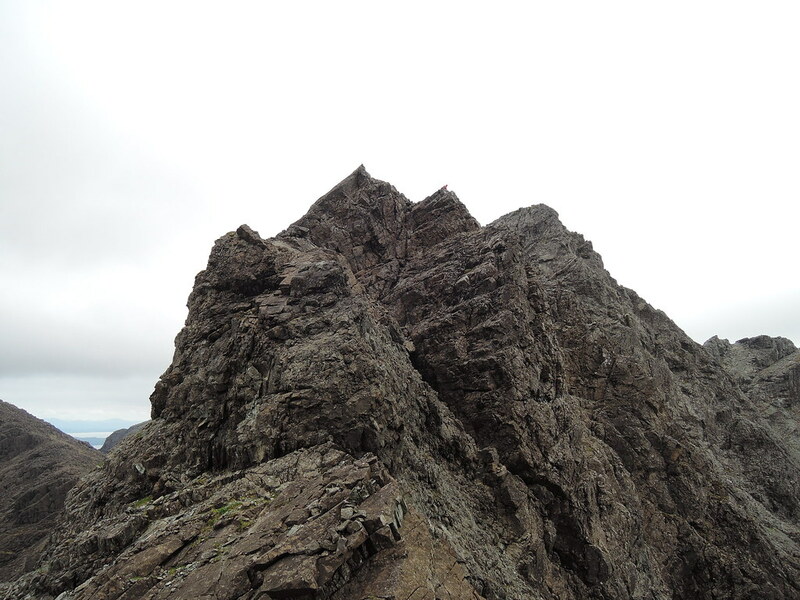 Well done for adding Sgurr Mhic Choinnich.